Nice get and from the Furd's backyard too! Recapping that's 8 for 2019.Missing any? Size wise seems about right, though it would be nice to have a couple of divers, especially with our best diver Phoebe LaMay will graduate after this year. Anyone can summarize the strength & weakness of this class? Looking at the class right now, it's very solid and mostly covered in all disciplines/distances. Fly (Ashlyn/Rachel), distance (Anna, Rachel, Sarah, Ashlyn), and sprints/mid-distance (Isabel, Danielle, Chloe and Emma) tend to be our strongest suits. IM group should also be no problem with Izzy, Chloe, and our distance swimmers who are also very talented in the IM. Chloe and Izzy are also very well-rounded, having enough versatility to be able to swim anything. Emma and Danielle have lots of upside, not to mention our distance swimmers who hopefully will be able to keep on with their rapid progression curves. 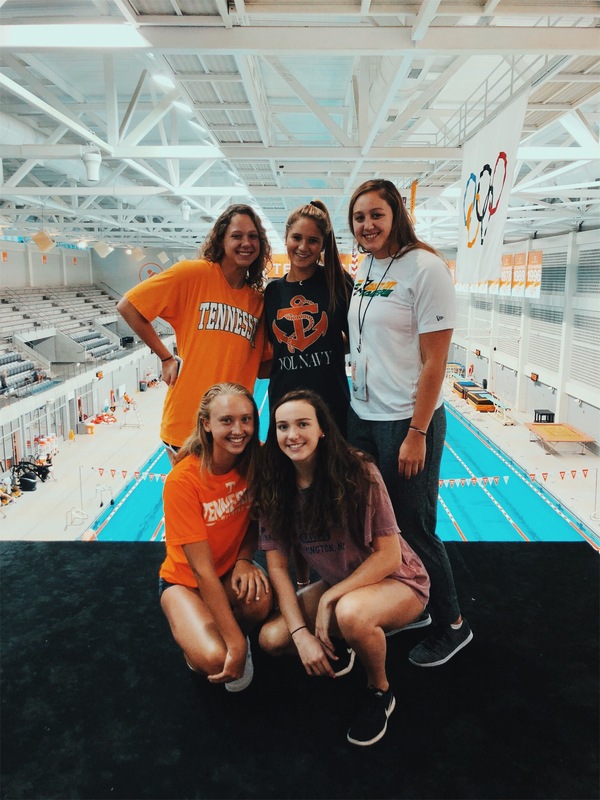 Backstroke (Chloe, Danielle) and breaststroke (Izzy, Emma) are relatively thin in this class, but with the amount of depth on the team when this class enters, along with the plethora of recruits to choose from in 2020, that shouldn't be too big of a problem. No matter which recruits LSJU gets for this cycle, I still think our class should top theirs by a wide margin. Sorry for the late response to OBear's question (been offline & sort of focussing on non-swim related stuff as of late), but very appreciative of swimmer19's spot-on summary of the 2019 class - well done! Reckon I'd take a rough stab at supplementing that excellent analysis by looking at some of our Baby Bears' more apparent strengths & versatility in the pool, in terms of their projected scoring potential in some individual events at the Championship level (relative to 2018 NCAAs or Pac-12s). Rankings are per CollegeSwimming at the time of the recruit's verbal. Should be pointed out that Izz's the only 2019 Baby Bear who has achieved an individual time projected to score at NCAAs (200 Free, 100 Free, 200 IM), along with the likelihood of making a contribution to our relays @ Nattys. As soberly noted by BD, "need two or three four year scorers per class to credibly compete for NCAA titles". Indeed, there's only ONE uncommitted recruit from that Top 20 list who has accomplished a time falling within scoring territory - Katharine Berkoff (aka KB3), whose 100 back & 200 Back bests would have placed in the B final @ 2018 NCAAs. KB3's rumoured to be an Ivies lean, though I'm sure the furdettes as well as a number of top swim programmes would love to snag the 2019 backstroke ace! Remaining top level as-yet-to-commits are a pair of Top 20 in-state studs, who could be targeted by Greg down on the Farm - but even this duo don't yet have quite the speed yet to qualify for an NCAA invite, in spite of having impressively dropped considerable time in several of their events as recently as May - Ayla Spitz (50 Free @ CIF Section Champs, 100 Free & 200 Free @ Sunset League Champs), and Alexandra Crisera (100 back @ 2018 CIF Section Champs). 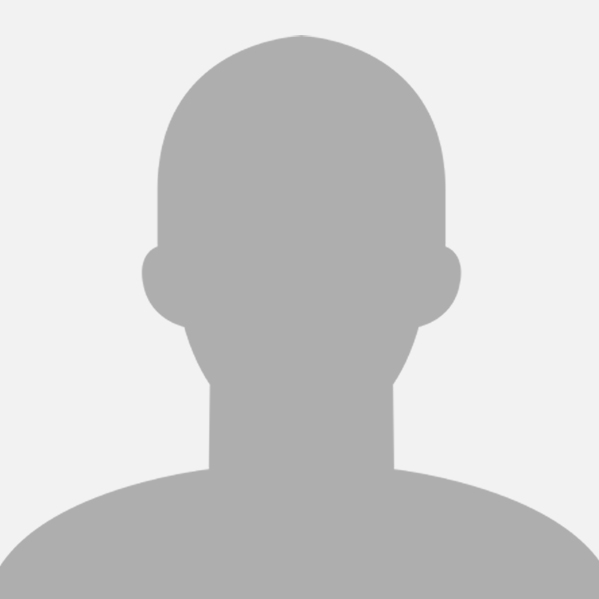 At any rate, back to the present hehe - our 2019 commits will have their forthcoming Senior year of competition to strive for further improving upon their HS lifetime bests, with several of them solid bets to earn that much sought-after invite to the big dance by their sophomore or junior year if not earlier, after some top class training at Cal. ... where #37 is the nominal NCAA cutoff line for invites. Will be interesting to see how Sarah, Ashlyn & Rachel develop in the mile & 200 Fly since these events fall on the same competition day (or which direction they will lean towards under Teri's guidance). Sarah & Ashlyn also seem to fit the 400 IM / 200 Fly / Distance mould of swimmers. As for the 1000 Free which is typically only contested @ dual meets, Bears will for once be able to field a rather solid sub ten-minute cadre in Ashlyn (9:46.42), Sarah (9:46.65), Rachel (9:51.23) & Anna (9:53.60). For reference, Cal's #2 all-time best in this race = Chenoa (9:40.26). #7 Missy was 9:47.44. Does appear that with this class, Bears will enjoy an unprecedented depth of talent in events where we haven't had much success with or representation in recent history - distance, longer IM & butterfly...well at least at the Conference & Dual meet level! Goes without saying that the usual caveats & caution applies - this is no means a comprehensive or even accurate assessment of their likely events ... static snapshots of best times aren't always the most accurate indicators of predicted performance ... should really also take into account the overall context, such as progression history & improvement curve (take note of, for example, Danielle & Emma's significant time drops recently), performance consistency & timing, background & environment (Emma being a 2 sport student-athlete who had only started to train full-time since Jan 2017), injuries & other setbacks (Ashlyn's battle w/scoliosis), team needs, etc etc. Ashlyn and Rachel will do the 200 Fly, and Sarah and Anna will do the 1650 in my opinion. Thanks Swimmer19 and UAC for your long and informative response to my question. Good stuff! Really look forward to this & future swim seasons. 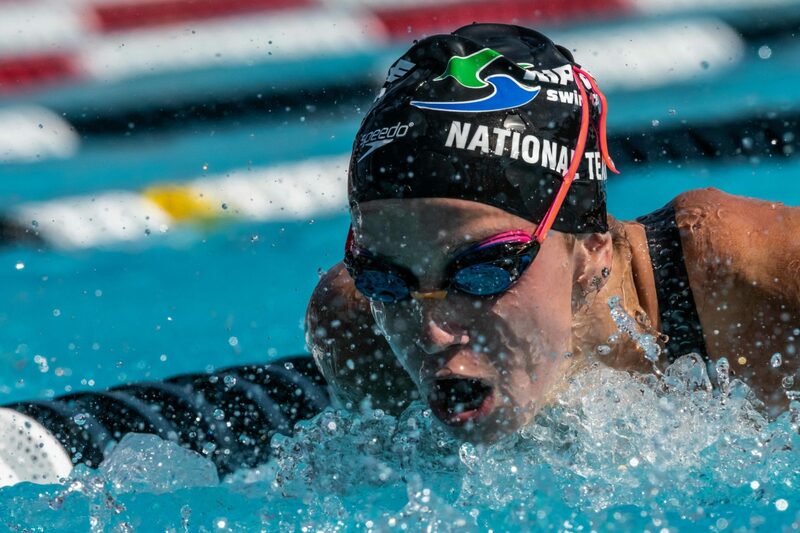 "The National Open Water Select Camp is an important stepping stone for young athletes as they look to take the next steps in their blooming Open Water swimming careers," said Mariejo Truex, USA Swimming's Program and Services Director. "In years past the camp has provided a solid foundation for the U.S.' best distance swimmers and we look forward to providing the same motivational and education experience for the next generation of distance swimmers." Averee: "I'm super excited to announce my verbal commitment to swim and study at Auburn University!! I'm so so grateful for the opportunity to be apart of such a great program. Thank you to everyone who helped me with this decision. War eagle!! Official visits also in progress at Bloomington. Anyway, looking ahead, reckon we'll get to catch a glimpse of our 2019 Baby Bears posing together with their future teammates sometime later this month? Am thinking that the main recruiting weekend for this season is likely going down on the 15th (2nd home game v. Idaho State) or possibly as late as the 29th (v. Oregon)? L-R: Emma Stephenson (2019 A&M), Sticklen (2020 recruit), and ? UPDATE: Assuming the ? recruit is Ellie McLeod (#133 Nat, #6 TX), a local visitor for 2020. Apparently quite a wave of recruiting trips are being hosted at various campuses throughout the nation this weekend. Believe the Gators held theirs yesterday. btw, both swimmer19 & beaz012 have unearthed a gaggle of social media clues as to which programme backstroke ace recruit Katharine Berkoff may be leaning towards - and, wow, it isn't an Ivy or even LSJU...but, ...NC State?! reckon we'll get to catch a glimpse of our 2019 Baby Bears posing together with their future teammates sometime later this month? Am thinking that the main recruiting weekend for this season is likely going down on the 15th (2nd home game v. Idaho State), or possibly as late as the 29th (v. Oregon)? There's also the Gala on the 22nd - but the team's scheduled to be down @ San Luis Obispo for the Cal Poly Queen & King of the Pool that Friday. Speaking of Ivey, congrats are in order for her hard work in the classroom and in the pool, culminating in earning USA Swimming's Scholastic All-American status! "I'm so excited to announce my commitment to swim and study at the University of California, Berkeley. Upon meeting the coaches and the team, I knew that this was the school for me! I am beyond grateful for this opportunity and I cannot wait to spend the next four years at Cal. GO BEARS!!!" Was originally fearing that Spitz might be a furdette lean - but heck, all is right once again in the multiverse as we now warmly embrace Ayla with a beary cheery welcome to Bear Territory!!! It was just 11 days ago that we released our annual NCAA recruiting class rankings for the current crop of juniors. We ranked Newport Harbor's Ayla Spitz 20th. 11 days later, she made that rank irrelevant. A 49.2/1:46.4 freestyler when we ranked her 20th, Spitz was more notable for a 1:58 IM and a 53.4 backstroke. But at the CIF Sunset League Championships, Spitz blasted a 1:45.44 in the 200 free to pair with a 48.88 in the 100 free, which should launch her well above 20th in the current recruiting landscape. Comparing to the rest of the high school Class of 2019, Spitz's free times alone now put her in line with #7 Alexandra Crisera (22.4/48.8/1:47.0) and #10 Kelly Pash (22.7/48.5/1:45.2), though she doesn't yet have the 50 (23.19) to match them. (And, of course, the rankings do still take into account versatility, other time drops and relay value, which is why Crisera and Pash's 50s weigh so heavily). 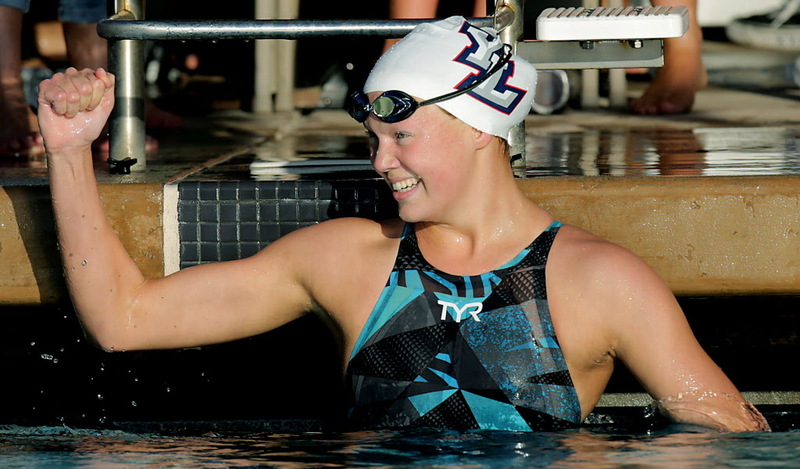 If Spitz is continuing her high school season into California's section and state meets, she could lower those times further, or swap events and look to better her solid IM and backstroke times. Either way, Spitz is on the rise at just the right time to climb up the recruiting lists of NCAA coaches. Congrats to the following 2018 & 2019 Baby Bears named to the Nat Jr Team today! Following world-class performances in 2018, 67 up-and-coming swimmers were named today to the 2018-19 USA Swimming National Junior Team. "This group of National Junior Team honorees, plus the 21 high schoolers who qualified for the 2018-19 National Team, is a testament to the incredible dedication and work being done at the club level around the United States," USA Swimming National Junior Team Director Mitch Dalton said. "With two years to go until the 2020 Olympic Games, USA Swimming and its supporters can be very excited about the depth and talent within the junior ranks." The complete National Junior Team roster can be found online here. National Junior Team members must be age 18 or under on Sept. 1, 2018. Any relation to Mark Spitz? Not according to this from the 1st writeup following: "No, they're not related to Mark Spitz, the nine-time Olympic swimming gold medalist. But they swim fast enough to make you think that they could be." "They are identical twins, but there are a few ways to tell Newport Harbor High freshmen Ayla and Zoe Spitz apart. Zoe is about an inch taller, and her hair is shorter. And when you talk to them, their personalities shine through, though those personalities are an area of contention for the sisters. Another similarity is that they are straight-A students at Newport Harbor, though they share just one class this year, second-period math with Mr. Dominguez. The math on the sisters' swim times? Just know that they are fast. Even as freshmen, they're the foundation for a promising young Sailors squad." She holds the school record in half of the eight individual events: the 50 freestyle, 100 free, backstroke and breaststroke. Ayla and Zoe Spitz, along with Stevens and Skibby, hold the school 200 medley relay record. The Spitz sisters, Stevens and Yasko also have both of the freestyle relay records. Ayla Spitz, the defending league champion in the backstroke and 100 freestyle, is also the defending CIF Southern Section Division 1 champion in the latter event. 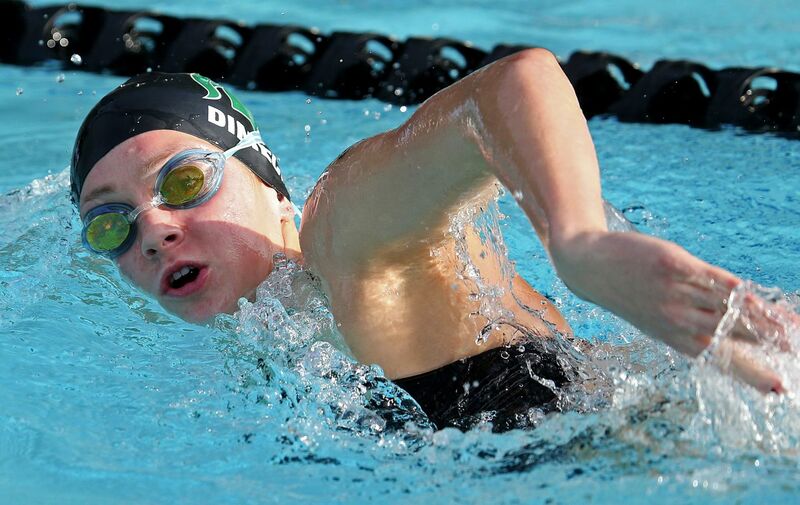 Her skills are such that her Irvine Novaquatics club coach, Adam Crossen, called her the most versatile girls' swimmer he's coached in 15 years with the program. "She's willing to do whatever to help the team win," Crossen said. "She's the stabilizing rock. She's becoming more vocal, but I think the main thing is that she leads by example. She's the total package." Spitz realizes that high school swimming isn't always about achieving a time. Sometimes, it's about helping the team win. When asked about any individual goals she has this season, she chose to the turn the attention to her teammates. "The most important part of high school swimming is just to have fun and bring up the rest of the team," she said. 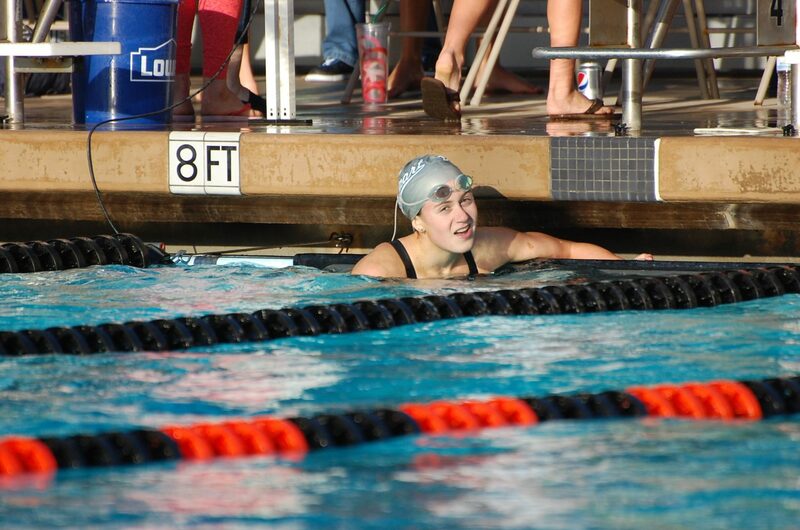 Ayla Spitz had not really heard of Cindy Tran before last week's Sunset League swimming finals. But Tran, the former Edison High star who went on to become a two-time NCAA champion in the backstroke at Cal, has one of those names that means something in Orange County high school swimming. More precisely, when a record of someone like Tran gets broken, people take notice. And that's what Spitz did on May 5 at Golden West College. The Newport Harbor sophomore swam a lifetime-best time of 54.16 seconds to win the 100-yard backstroke, breaking Tran's 2008 meet record in the event by more than a second. In the 100 freestyle, Spitz was no less impressive, also winning that event at Sunset League in another lifetime-best time of 49.64. That time ranked sixth in Orange County history. And she anchored two impressive relays. The Newport Harbor 200 medley relay team of Ayla, her twin sister Zoe, Kili Skibby and Dinny Stevens touched in another meet-record time of 1:45.76, lowering their own school record. 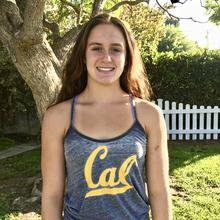 NEW COMMIT: Newport Beach, Calif. native Ayla Spitz has announced her verbal commitment to the University of California Berkeley beginning in the fall of 2019. She will join Danielle Carter, Emma Davidson, Anna Kalandadze, Isabel Ivey and Rachel Klinker as members of the class of 2023. Spitz does her club swimming with Irvine Novaquatics and is a seven-time U.S. Open qualifier. She concluded her long course season at Junior Nationals where she finished fourth in both the 100m free (56.43) and 200m free (2:01.76) after recording a best time in the 100m back (1:02.53) at Nationals a week prior. At Speedo Juniors East in December, she was a four-time finalist and notched five lifetime bests. Spitz was also the 100 back (53.54) champion at the Carlsbad Speedo Sectionals. Representing Newport Harbor High School, she won the 500 free (4:45.91) and was the runner-up in the 200 free (1:45.56) at the CIF Southern DI Section Championships as a junior. 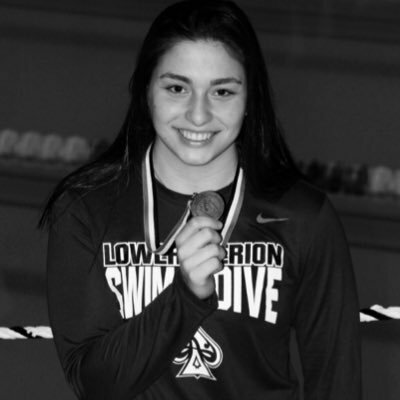 During her sophomore year, she placed second in the 100 free (49.77) and fourth in the 100 back (55.39). She has also earned NISCA and USA Swimming Scholastic All-American honors. Spitz's versatility will be valuable for the Golden Bears in a number of events when she arrives on campus for the 2019-20 season. Her best 100 back time would've scored in the A-final of the 2018 Pac-12 Championships, while her 200 back, 200 IM and 400 IM would've placed in the B-final. Under head coach Teri McKeever, Cal finished second at last season's conference meet and at NCAAs. Natalie Whalen: "I am thrilled to announce my commitment to the admissions process to swim and study at Harvard University!! I am incredibly thankful for this opportunity and for my family, coaches, teachers, teammates, and friends who have supported me along the way. Go Crimson!!" After USA Swimming opened this past year's Scholastic All-America selections to 9th graders, the numbers soared with 239 freshmen members to the team. If the team were to remain open to 10th-12th graders, there would be 1,383 Scholastic All-Americans, roughly 200 more than last year's team. The Southern Zone lead the way with 445 Scholastic All-American selections. North Carolina had the most selections of the LSCs with 120 Scholastic All-Americans, while SwimMAC Carolina snagged 47 SAA selections. Although no perfect scores this season (National Champion and 4.0 GPA), there were 180 three-timers selected to the team. With the first year featuring all 4 grades, the 11th graders were the most populous grade with 564 Scholastic All-Americans. And amongst our bears, quite a few uncommitted recruits are highlighted as well, including but not limited to Regan, Emma Sticklen, Abby Harter, Olivia Bray, Isabelle Stadden, Ella/Mia Ristic, Luca Urlando, Ethan Dang, etc. Are the Spitz twins related to Mark? Looks like the batch of 2019 Hoos made it down to Charlottesville...no new surprises. 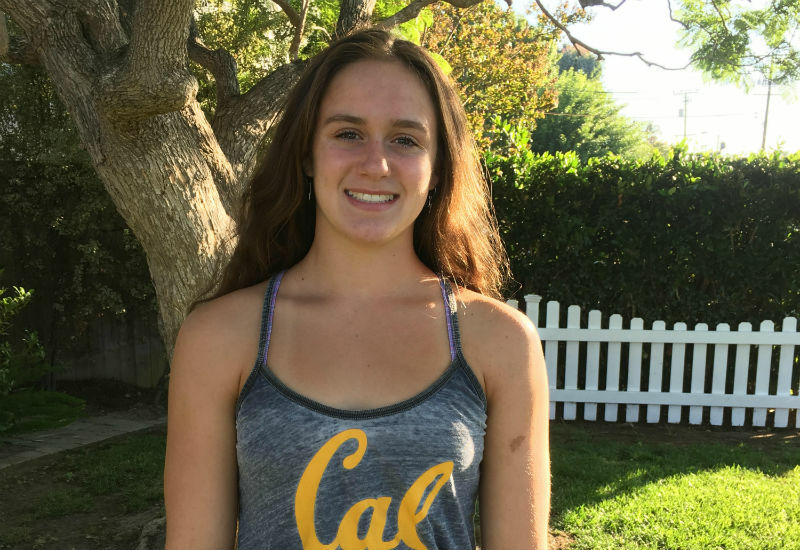 Ayla Spitz of Newport Harbor High School in California, related to twin sister Zoe Spitz but not related to 9-time Olympic gold medalist Mark Spitz, has verbally committed to Cal. She will join the team in the fall of 2019. One of the top recruits in the class out of Orange County, and the #20 recruit on our list of the top 20 girls from the class of 2019, Spitz is a versatile swimmer who projects as a middle-distance freestyler, backstroker and IM'er at the collegiate level. She joins a Cal team that, led by head coach Teri McKeever, that has won more backstroke titles than anyone in the last 20 years, and has shown recent success in the IM races as well. Cal has won 10 of the last 18 NCAA titles in the 100 back, 8 of the last 17 NCAA titles in the 200 back, and 4 of the last 7 NCAA titles in the 200 IM. In long course, Spitz also has Summer Nationals cuts in the 100 back (1:02.44), the 200 free (2:00.74), and the 200 IM (2:17.60). That 200 free time tied her for the 6th-best among American 17 & unders in this summer's long course season. 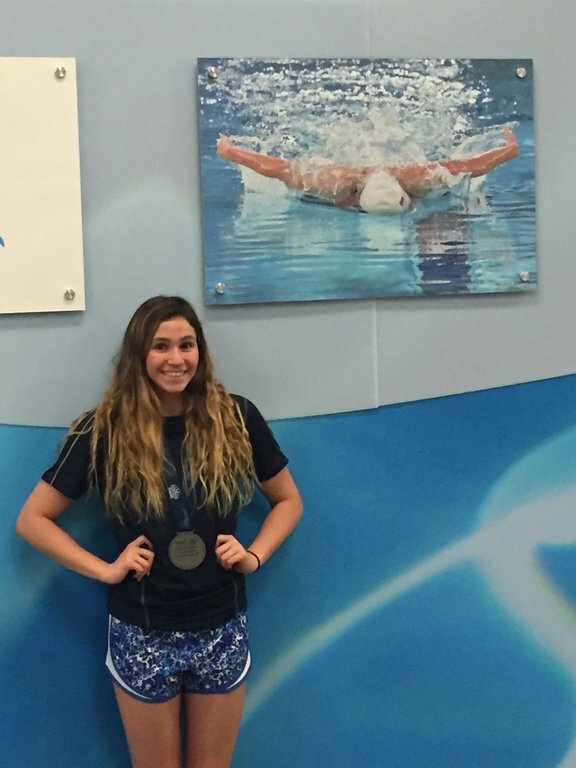 She finished 4th in both the 100 and 200 freestyle races at Junior Nationals this summer. She already has NCAA "B" time standards in the 100 free, 200 free, 500 free, 100 back, 200 back, 200 IM, and 400 IM. Her twin sister Zoe, who is more of a butterflier (55.21/2:01.68 in yards), has not yet announced her college decision. Both swimmers train with Irvine Novaquatics.